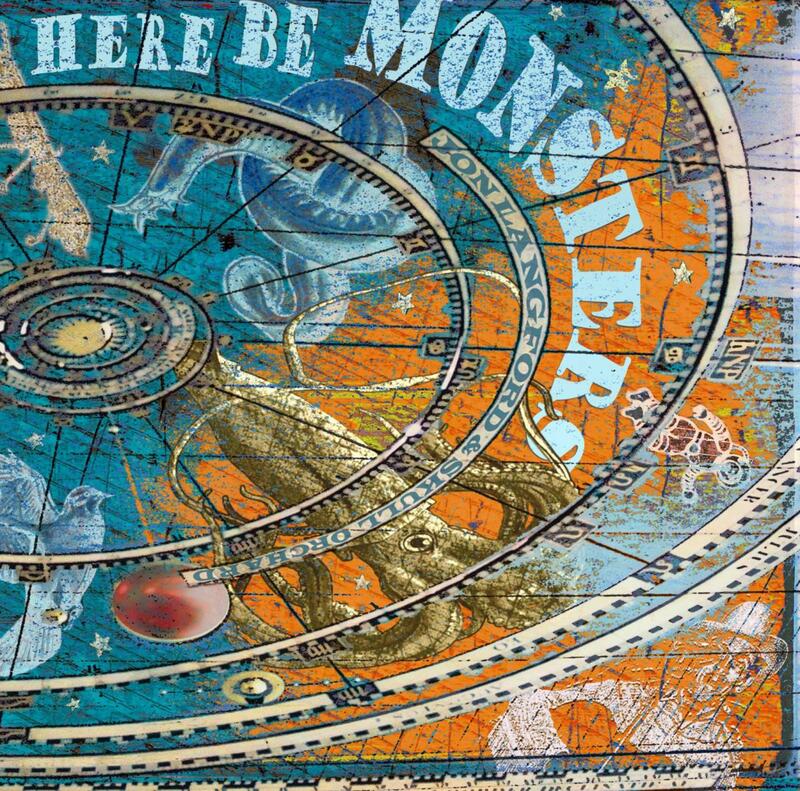 Here Be Monsters finds acclaimed musician/visual artist Jon Langford and his band Skull Orchard scanning the outskirts of popular culture, its title born of medieval cartographers’ term for the dragons, sea serpents, and other mythical beasties that reside beyond the boundaries of the known universe. This album features a unique piece of artwork specific to each track printed on individual inserts included with copies of the CD. Best known for his work in the The Mekons and the Waco Brothers, Langford has been a leading pioneer in the assimilation of folk/country music into punk rock since the genre's first evolution over 30 years ago. The album sees the Welsh-born, Chicago-based singer/songwriter, bandleader, producer, painter, and poet plotting a clear-eyed, sharp-elbowed course through such far-flung subjects as alternative hierarchies and astronomy, perpetual war for perpetual profit, the culture of detachment, middle age, fatherhood, fame, and the fleetingness of love. "The subtext of the album is maybe the things our civilization thinks of as fixed and immovable might actually be redundant/obsolete/discredited and it's up to us to question and find new rocks to be washed up on…," says Langford, who called in Mekons/Waco Brothers veteran Mike Hagler (My Morning Jacket, Wilco, Neko Case, Billy Bragg) to record this album at Chicago's Kingsize Sound Labs. "Skull Orchard used to be a fairly solitary activity – songs that didn't fit anywhere else – stuff that was too Welsh or personal to bother the Mekons or Wacos with," says Langford, "but something happened with the band I formed to tour with the previous record. It turned into a real group, so this is much more of a band project than any of the solo things I've done before." Also known for being a prolific visual artist, Langford designed all the artwork for Here Be Monsters himself, including individual designs for each track that will be showcased on separate inserts in the CD and in a collage on the LP jacket. "This album really brings the art and the songs together – a chicken/egg which came first situation. The songs are very visual and in some cases came directly from the paintings," continued Langford. "Star maps, strange creatures, sympathetic monsters, monsters we have created – the little poem at the top of the album is all about that." Let’s focus on the primary constant – Langford’s barkeep approachability and an affable approach to political frustration and career disillusionment. I'm here to recommend this new album of his, a collection that finds creative ways to dramatize man's impulse to destroy. Embodies all of the qualities of Langford's best work, emphasizing the bittersweet, introspective edge that's become increasingly prominent in his work in recent years. Langford’s voice remains gruff and gregarious, a tattered flag still happily flapping over a landscape littered with the bones of his contemporaries who didn’t make it.